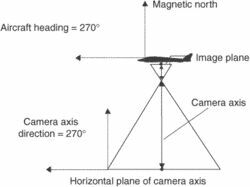 In the above case, aircraft heading and camera axis directions are same. The direction on the horizontal plane of the optical axis of the camera at the time of exposure. This direction is defined by its azimuth expressed in degrees in relation to true, or magnetic, north.